San Diego Contra Dance is an offspring of San Diego Folk Heritage, a 501(c)(3) nonprofit organization consisting exclusively of volunteers dedicated to preserving and promoting the folk arts in Southern California. We are a community of dancers, dance callers, and musicians who come together each week to contra dance in San Diego. For the uninitiated, a look at the video clip just above gives some idea of what contra dance looks like: it shows dancers from San Diego, Los Angeles, and elsewhere, participating in the Labor Day Dance Away event near Julian in northeast San Diego County. Whether you're a beginning contra dancer, a newcomer to San Diego, an experienced dancer, caller, or musician—or just someone who's curious about contra dancing—we invite you to have a look at our website! Click around, go nuts—you won't break anything! Meanwhile, on this page you can learn more about where we dance, how to contact us, our new smartphone-friendly webpage, and how you can get involved in our dance community. San Diego Contra Dance is now seeking sponsors to help us defray our expenses. Click the image at left, or click here, and find out how you can help—and also receive your very own San Diego Contra Dance name button with a minimum donation! 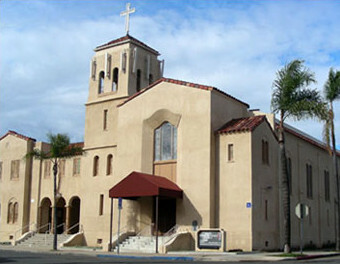 Our dances take place in the hall of Trinity United Methodist Church (pictured), located at 3030 Thorn Street, San Diego 92104, on the northwest corner of Thorn Street and Grim Avenue. Dance Manager: This person is responsible for collecting money at the door, bringing and setting up refreshments for the break, and completing a payout schedule so that the caller and band members can be paid. Managers are of course admitted to the dance free of charge, and are paid a stipend of $20 for the evening. Sound Technician: The sound tech is responsible for setting up our sound equipment for the caller and band prior to the dance, monitoring that equipment as necessary throughout the evening, and packing it up when the dance has ended. Some background in setting up audio gear is desirable but not required; volunteers will be trained. Sound techs are also admitted free of charge and paid a stipend of $20 for the evening. New Year's Eve Dance Subcommittee: Our annual New Year's Eve dance is our grandest event of the year, and requires considerable effort to execute. We always welcome people to help out with organizing this event, or to assist in decorating the hall beforehand and tearing down afterward. More information will be made available as each New Year's event draws near. Assistant Web Developer: This person should be ready to step in on short notice in case the principal web developer becomes indisposed in some way. Duties are minimal and would consist chiefly of updating this page to announce the upcoming dance for the week. Over the long term, the assistant web developer might also update the Dance Schedule page, making changes and corrections when called for. In most cases some basic knowledge of HTML, and knowing how to use an FTP client program to transfer files, are desired. In any case, this person will be trained by the principal web developer. Social Media Administrator: This task calls for someone who is media-savvy and would like to administer (or co-administer) our Facebook page and YouTube channel. Community Band: Our community band, More the Merrier, is an all-volunteer ensemble of musicians who perform for contra dances about once each month. Anyone who plays an instrument is invited to audition for the band, and there is no entry fee for participating. See this section of our Meet the Bands page for details. Other Volunteer Opportunities: We welcome volunteers in all capacities, large and small! Even if you cannot make one of the greater commitments noted above, we still need people to stay after 11 p.m. to break down audio equipment and fans and store them, move chairs and tables back to their original places, sweep the floor, vacuum the rugs, empty trash containers, and so on. If you're particularly adept at cooking and baking, we'd love it if you donated some homemade goodies for the refreshment break. It's a great way to show off your culinary prowess! Once every quarter, San Diego Contra Dance holds a committee meeting to arrange a dance schedule for the following quarter and attend to a myriad of other organizational matters. These meetings typically take place on the first Sunday (sometimes the second Sunday) of the months of March, June, September, and December. There is a potluck breakfast at 9:30 a.m., and the meeting begins shortly thereafter; meeting dates and locations are announced beforehand. These meetings are run very democratically, and all dancers are invited to come and participate. One key benefit of attending is that your vote will count as long as you're present, even if you're a first-time attendee, or don't attend regularly, or you don't consider yourself to be a committee member. Don't hesitate—stand up, be heard, and do great good for your contra community! We would like to thank and acknowledge Vince Fry for granting permission to use excerpts from the Labor Day Dance Away video that he shot and edited in 2012. Credit is also due to Icon Archive for offering remarkable icons that are in the public domain, and available for commercial use as well.